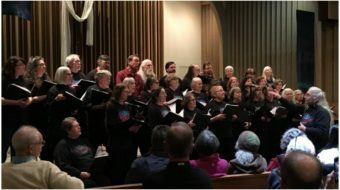 WASHINGTON – Aided by a huge contingent of unionists, at least 10,000 jammed the Capitol lawn April 10 to demand comprehensive immigration reform. Led by advocates for Latinos, Asian-Americans, and African-Americans, the crowd demanded Congress pass legislation providing a path to citizenship and other legal rights for the estimated 11 million undocumented people in the U.S.
And that includes the right to unionize and collectively bargain, said Auto Workers President Bob King, one of five union leaders to address the crowd. Organizers called the rally as bipartisan groups of lawmakers are on the verge of unveiling their versions of comprehensive reform. The reform should include not only a path to citizenship, but provisions for family unification, and an end to deportations, which are running at 1,400 daily, speakers said. The Service Employees accounted for between 1,000 and 2,000 people in the crowd, Hector Figueroa, president SEIU Local 32BJ, which represents building service workers, told Press Associates Union News Service. The UAW sent several busloads, as did the National Education Association. Casa de Maryland, a Latino group whose staff is represented by The Newspaper Guild-CWA, contributed hundreds. And the Farm Workers draped their black-eagle on red flag over a sidewalk wall when one of their officials spoke, entirely in Spanish. Chants of “Si se puede!” were common. So were cheers for advocates, and so were water bottles, in the 90-degree heat. 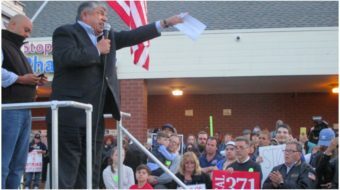 King encouraged the crowd to keep the pressure on Congress. “Change never happens unless people come together to march, rally, demand and sit in,” the veteran activist, unionist and civil rights crusader declared. “We commit to stay in the movement, to demand a path to citizenship, to families being reunited and that workers – immigrant workers and other workers – have the right to collectively bargain. Hasta la Victoria!” he concluded. And Rep. Luis Gutierrez, D-Ill., one of the House working group drafting that chamber’s version of a comprehensive bill, sounded the same theme. He exhorted the crowd, in English and Spanish, to keep the pressure on lawmakers until immigrants not only get citizenship through the new law, but the right to vote. The warnings from King and Gutierrez point to one high hurdle backers of comprehensive immigration reform still face: The attitude of the ruling House GOP, many of whose radical right/tea party members are dead set against any immigration legislation at all. 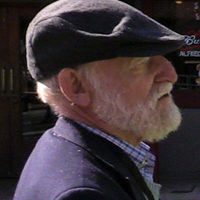 Others are willing to grant a path to citizenship of 15 years or more. “Work hard, keep pushing us, and we’ll have immigration reform,” Gutierrez said, to cheers. But one UAW officer from Michigan gave an example of the more-common attitude in the House GOP. He told PAI that his Latino members in the state’s “thumb” – where thousands of workers pick fruit and vegetables – have gotten no response at all from their lawmaker, GOP Rep. Candice Miller. Nevertheless, lawmakers were optimistic a comprehensive immigration reform bill would emerge this month. One negotiator, Sen. Robert Menendez, D-N.J., predicted the eight lawmakers there would have “a strong foundation” of a bill in time for hearings scheduled for the week of April 15. Union leaders emphasize immigration reform helps all workers. That’s because venal and vicious employers exploit undocumented workers and threaten them with deportation if they organize. And those employers also force native workers to accept low pay and no benefits, under the threat of being replaced by undocumented workers who can’t legally fight back. 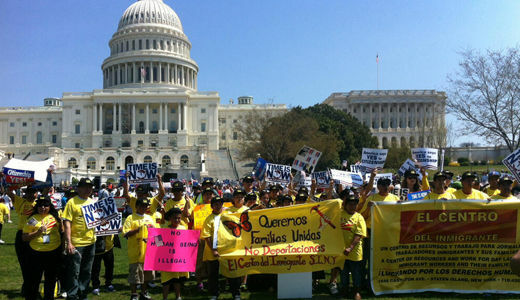 Local 32BJ isn’t waiting for immigration reform to organize more workers, native or undocumented, in its 9-state domain stretching from New York to Virginia, Figueroa told PAI. “We don’t ask about their status, but I hope passage of immigration reform will give them more confidence to organize,” he added.